The Lone Ranger seems intent to capitalize on the success of the Pirates of the Carribbean franchise, which is only really connected through its studio, director, star, and purported scope. Fifteen years ago if you had told me that the biggest Independence Weekend Movie was a retooling of a 1930s radio show that was primarily seen as a follow-up to a multi-billion dollar grossing quadrilogy based on a theme park ride, I may have punched you in the face on my way to watching Armageddon (1998). 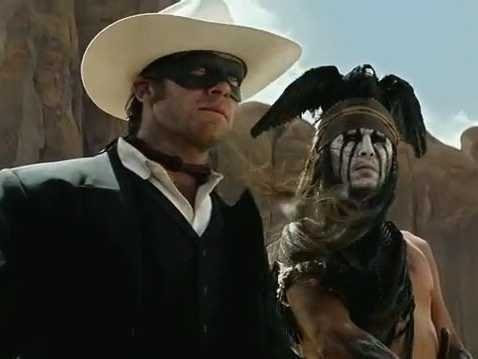 The most interesting thing about The Lone Ranger as a movie is the simple fact that its existence signifies that just about any property can be transformed into a giant event movie full of enormous scope and spectacle. I can't imagine what the creators of the radio show would think about this big nuttiness on screen, surely it's more than they ever could have foreseen. It's really wild. There is also no discernable story here, it just seems like Johnny Depp and one of the twins from The Social Network (2010) are having a raucous time in the wild west. It's also possibly the only film that has been more heavily promoted this year than Man of Steel. Ultimately, the Big Blue Boy's opening was underwhelming (yeah it was considering the hype and how heavy the marketing was), and this will likely be more of the same - if the product just isn't that good, people won't show up. Truth be told, the fact that Armie Hammer played both the Winklevoss Twins in The Social Network is more astounding the more you think about it, and he's certainly a competant actor who deserves a big A-list career. He needs to be really memorable in The Lone Ranger, though, because as of now, this movie is all Johnny. Depp has had a wacky career of his own. Almost similar to Brad Pitt, he graduated from an outstanding small movie actor in the 90s to one of the last great stars who can headline a movie on his own. It's a shame that instead of deep, high quality roles like in Ed Wood (1994) or even Fear and Loathing in Las Vegas (1998), he's basically resigned to loud, quirky characters under thick layers of make-up. Like in Charlie and the Chocolate Factory (2005). And Sweeny Todd: The Demon Barber of Fleet Street (2007). And Alice in Wonderland (2010). Dark Shadows (2012). Which brings us right up to The Lone Ranger. It's tough to be critical of his collabos with Verblinksi, though, considering if not the success of every Pirates movie, then certainly the success of Jack Sparrow, the Jester of Tortuga. Not to mention Rango (2011) is one of the best films of the past decade. Speaking of great animated films, Despicable Me 2 would seem to threaten if not The Lone Ranger this weekend, then certainly the prospects of Monsters University (2013). The first film was cute and entertaining, if not totally great. 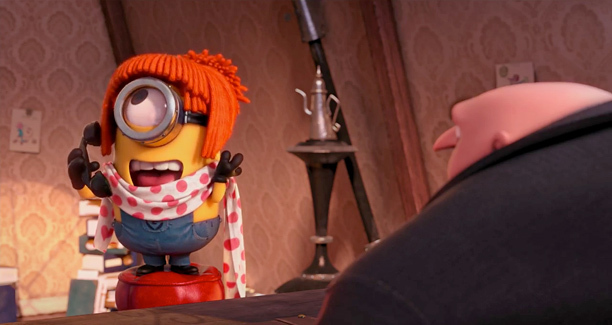 If anything though, it gave us the Minions, who seem to be a continuous source of old school wackiness. Most notably, this tiny little film from the animation studio out of Universal Pictures is now a vibrant franchise that has secured an Independence Weekend Release. There is no real coherent story that is apparent in the storyline of Despicable Me 2, either, besides Gru apparently being called on to save the world and the Minions being goofy, but that seems to be about it. That's really all this flick comes down to, which is fine. I don't think this will enter the annals of animated film history, although it should add to its own legacy and will probably do well in theaters. The marketing material hasn't done a thing to differentiate itself from the first film, which is as good as it is bad. It's great news for fans of the first installment, which promises more of the fun, but at the same time it's not offering anything new. Ultimately I can picture myself catching this, but I can wait till it's on USA in two years. Actually, I think the first one just snuck on to ABC Family. While Despicable Me 2 has effectively narrowed the kid's market, even though Monsters University had a surprisingly good hold, this weekends is really all about The Lone Ranger. I am still curious about the inherent racism in Depp's performance, but he's apparently a Comanche, so whatever. Here's another spoilerific article defending the film's racism. It's certainly a debatable subject, and I'll wait to reserve judgment until I actually see the thing and how Depp portrays his Native American character. Still, he's effectively working in redface (is that alone a racist term? Indianface? Jeez that sounds worse), no matter what his tribe says. Ultimately, Tonto just needs to be a fully fleshed out character in a good movie to really be accepted. If anything, Depp and that stupid dead crow on his head ought to enter the cultural lexicon. Lastly, it's widely known that The Lone Ranger is related to the Green Hornet (he's his great-uncle, specifically), which just means I really want to see a Seth Rogen cameo. Will you be high-hoing Silver this weekend?